Comfortable and bright apartment set in the historical centre of the town, walking distance from the Cathedral, near shops and restaurants. With 2 sofas coffee table, fireplace, bookshelves, armchairs, TV, dvd player, stereo, table and chairs, wardrobe, cupboard, window, stairs leading to the first floor with terrace. With library, cupboards, armchair, door window leading to the terrace. With table and chairs, view on the town, barbecue. Independent heating, TV, dvd player, stereo, washing machine, dishwasher, fireplace, fans, terrace, internet WiFi, no elevator. The apartment is located in the middle of the old town, in the oldest street, very close to the cathedral, theatres, most of the location to see. It is located in the second/top floor (no lift) with a view of the Rocca, St Peter and Monteluco. Two very large bedrooms, well furnished in all details, one large living room with fireplace, one well equipped kitchen with a fireplace and 1 large bathroom with tub and shower. The house is very comfortable. A spiral staircase brings to a library-room and a terrace overlooking the old town where to enjoy a good glass of wine or a light barbecue. The library has a very confortable single bed too, but it might be cold in winter and hot in summer. No need of a car unless for leisure in the neighborhood. This is my second house where I spend lots of my time far from Rome, when I want a rest. In the house there are three flats only. I am on the top floor (second) with the terrace. I have another place in Spoleto where I stay if the apartment is used so ready to help in case of need, and also many other friends in town and surroundings. I love to have my guests for a real Italian meal in my little hut in the middle of an olive grove when I am in Spoleto. Spoleto is a very interesting place, full of important monuments with rests of 7 archeological periods that show its important role in the history starting from the roman age. The recent restoration of the entire Rocca Albornoz with the very new Civic Museum make this town a very important art center. We can organize on demand cooking lessons, restoration stage, special sightseeing in the sorroundings directly with local people to get to know at the best the beauty of this place. At 30 minutes driving a golf is also available (Perugia at 60 km), as well many other sports activities like rafting in the Valnerina, riding, trekking, no way to get bored or just relax! If you are looking for a place where enjoying your visit of this "green" Italian region, full of history, nature, events, this is your place. You will not be disappointed but you will love it. A wonderful house in Spoleto. Very close to the centre. Lovely terrace with a splendid view of the mountain. Owner Comments: I was very pleased to read your extensive comments when I was back to Spoleto. Very happy you enhjoyed your stay. I love to have such wonderful guests as you have been. I met Gianna the owner of the resgaurants you visited and she is saying hello to you both. I wish you all the best for this summer. We (a party of three women) just spent an absolutely wonderful week at this Spoleto apartment in September. Centrally located, a close walk to all the sights Spoleto has to offer, with some fine shopping/restaurants nearby. The apartment itself felt like home – beautifully appointed with many conveniences, and the view of the Umbrian countryside from the upstairs terrace is not to be missed: best enjoyed with a glass of wine or two! The whole living area feels warm and welcoming, and certainly a place one can easily settle into, whether for a short- or longer-term vacation rental. The owner was also so kind and generous with her time that we were made to feel like friends/family. I can’t say enough good things about our experience and if/when we return to Spoleto (which I certainly hope I will! ), we will eagerly rent this flat again – highly recommend. Grazie mille! A wonderful, homely apartment in a quiet location in Spoleto. We had the feeling of living in Spoleto - a very special part of staying in an apartment like this as opposed to one set up for rental only. The apartment owner looked after us so well and helped make our stay in Spoleto very special during Festival time. A highlight of the stay was watching the fireworks at the end of the Festival from a premium position on the rooftop terrace of the apartment. Nous avons passe quinze jours tres sympa cet ete 2011 a Spoleto l'appartement est agreable a vivre, frais avec sa terrasse sur les toits. Il est situe au coeur de cette delicieuse cite medievale de spoleto ou tout se fait a pied. De nombreuses choses a visiter et tous les soirs, il y a des concerts gratuits dans les cours des palais, un vrai bonheur. My husband and I had an overnight stay in this wonderful, well appointed apartment in Spoleto. The apartment was very clean and tidy with all the necessities to make for a comfortable stay. It has a large open-planned living area and 2 spacious bedrooms with a rooftop sundeck overlooking the Umbrian hills. The apartment was a short walk from the town centre and other main attractions such as the Castle on the hill. We felt very safe and secure in this apartment. We would certainly recommend a stay here. Esta muy bien mantenido. Su duegna es muy agradable y nos recibio muy bien . 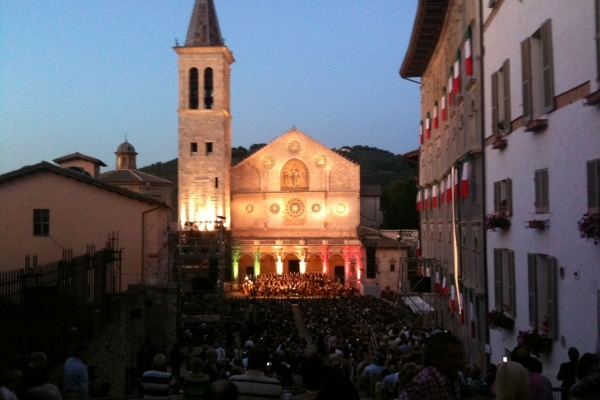 forget Tuscany, Spoleto has a wonderfull spirit and a tight comunity, you feel like you are a part of a big Italian Family! and not too touristy. It brings a tear to my eye just taliking about it. The place is very large and comfortable in a great location, walk to everything, very historical, you feel like a local staying there. Terrific neighbourhood with good restaurants and shops. Stunning view from the top terrace, We loved it! Owner Comments: thank you! it has been a pleasure getting to know such a wonderful couple!